When I arrive in Waterhead, a man and woman are creating candles to contribute to the memorial. Their own real life intersection with Katrina cuts even closer. "I have a friend that's still missing," Sunny Buttercup tells me, frowning. "No idea if she's OK. She's seven months pregnant." Sunny begins crying at that. Sunny also worried about Jordon Jensen, the brawny man next to her, because he lives in the region, and went offline as Katrina closed in. Jordon now has the title "I survived Hurricane Katrina" over his head. He was in a Louisina parish when it hit, he tells me. "Oh my god," he says, "it was very bad, very wicked." Despite that, he didn't run away from the danger, but instead turned back, to where the storm had done some of its worst, in New Orleans. He wanted to get there to help. "I drove to the foot of the causeway," he says, "and was turned around. And helped people on the way back and when I got home." A couple of his friends are still missing, though he hopes they've made it to Houston. "I have never in my 43 years on earth even with the military or law enforcement seen this much destruction, it really scared me," Jordon Jensen tells us. "It's bad, man. The levee system in New Orleans was only built to withstand a category three hurricane." Katrina was a Cat 5. To give some reference to his sense of destruction, Jordon was in the Middle East during Desert Storm. "I tried to go back [into the service after] 9/11 but no, I was too old... I don't think it will be as many lives lost [over Katrina, as the September 11 terrorist attacks.] But the destruction is going to be horrible... you have corpses floating out of graves. "Hamlet," Jordon tells me, "the only thing I know to do is survive and help." - There will be a memorial at the Waterhead site in approximately 30 minutes, at 4pm Second Life/Pacific Standard Time. 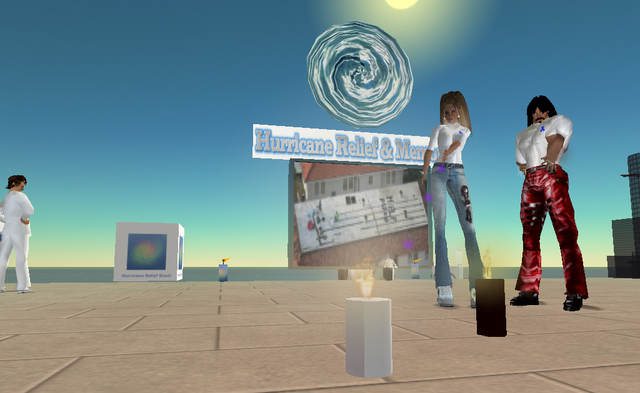 - Kim Richelieu has started an in-world group called Katrina Relief-- click Find/Groups/"Katrina Relief" to locate and join. "Right now we have some donation signs set up in-world at various locations," she tells me. She raised L$30,000 last night, approximately $120. "Any help or assistance would be GREATLY appreciated. I have loved ones in Gulfport and have been sick with worry for them. This is the only way I can keep myself occupied." - Alexa Martini tells me: "I am collecting donations and am donating all sales from my store, until further notice, for conversion to real US dollars to send to Louisiana to help those in need. Also, Zaza Metrolpolitan and I are going to have a yard sale, and the Lindens collected from that will be converted and donated. We are looking for people who want to sell their items at the yard sale-- all items should be boxed to be one prim. Anyone interested in selling should contact me or Zaza in-world." » Adderall tweaked. from Adderall. » Snort adderall xr. from Taking adderall. Thanks for the nice article about the Hurricane Relief and Memorial Site. I am trying to start a little movement for people to donate their stipends on Tuesday. I mean we can all go without new bling or prim hair for once week. I know I can.
. I wish all good luck. Whole. Great content on the web!